BenQ had added yet another new and upgraded eSports gaming monitor to their lineup. The BenQ ZOWIE XL2536 is the successor to the BenQ XL2430 which also offers 144Hz, Full HD resolution, and a 1ms TN panel. 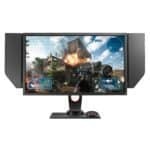 The BenQ XL2536 comes with the anti-glare shield and the DyAc technology and features a 24.5-inch screen as opposed to the 24-inch BenQ XL2430. Based on a TN panel, the BenQ ZOWIE XL2536 ensures the rapid 1ms response time speed which eliminates motion blur and ghosting in the fast-paced games. Along with the 144Hz refresh rate and the backlight strobing technology, the monitor is suited for the high-end competitive and professional gameplay. Though the 1920×1080 Full HD resolution is rather mediocre, it will still ensure crisp picture due to the decent pixel density of roughly 90 PPI. Besides, the 1080p resolution makes for a smooth gaming experience without demanding system requirements. 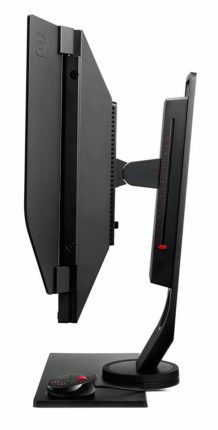 BenQ gaming monitors are known for the impeccable input lag performance which we can expect from the BenQ XL2536 as well. With 144Hz refresh rate, you’ll have the edge over your opponents in competitive FPS games as the image refreshes more than twice as fast. The DyAc (Dynamic Accuracy) technology further improves the clarity in fast-paced video games by reducing the perceived motion blur. When combined with the already quick 1ms (gray to gray) response time speed, fluid gameplay is ensured. 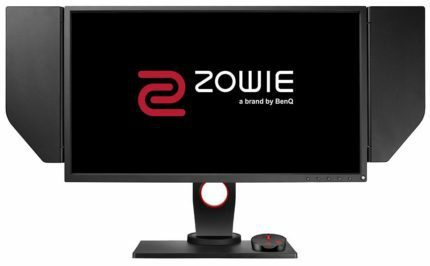 The BenQ ZOWIE XL2536 144Hz eSports gaming monitor also includes the S.Switch device which allows you to quickly adjust certain OSD (On-Screen Display) settings, swap through the customizable gaming presets, and more. Another useful gaming feature we’re used to in BenQ gaming monitors is the Black eQualizer which increases visibility in the dark areas of games by adjusting brightness and gamma when it’s needed. The display also comes with the anti-glare shield which allows you to eliminate all distractions and focus on your game. The BenQ ZOWIE XL2536 design offers everything a gamer may need including versatile ergonomics and special frame design that eliminates reflections. Ergonomic functions include 140mm height adjustment, tilt, swivel, pivot, and VESA mount compatibility. The connector ports are as follows: a Dual-Link DVI, a DisplayPort 1.2, two HDMI 2.0, two downstream USB 3.0, one upstream USB, and one USB 2.0 for the S. Switch device. Additionally, there are audio jacks for the headphones and a microphone. The BenQ ZOWIE XL2536 is already available and priced at $429. Considering its plethora of features and impressive specs aimed at competitive gamers, the monitor will certainly interest players who wish to take their gaming a step further.